Text color on all "Delete" links are displayed in red color. It should display same red text color on "Delete" link for widget. Delete menu.png​ (27.3 KB) - added by monikarao 3 years ago. Delete Menu link for "Menus"
Trash button.png​ (7.5 KB) - added by monikarao 3 years ago. delete-widget.png​ (13.8 KB) - added by monikarao 3 years ago. delete-widget-example.png​ (12.8 KB) - added by lukecavanagh 3 years ago. before patch.png​ (18.2 KB) - added by patilswapnilv 3 years ago. after patch.png​ (18.6 KB) - added by patilswapnilv 3 years ago. patch-to-37016.diff​ (435.1 KB) - added by patilswapnilv 3 years ago. patch-to-37016-revision.patch​ (726 bytes) - added by patilswapnilv 3 years ago. 37016.diff​ (328 bytes) - added by ibachal 3 years ago. Screen Shot 2016-08-18 at 1.29.06 AM.png​ (191.7 KB) - added by ibachal 3 years ago. Screen Shot 2016-08-18 at 1.30.44 AM.png​ (64.8 KB) - added by ibachal 3 years ago. 37016.2.diff​ (862 bytes) - added by afercia 3 years ago. I took a shot at this and made the changes as required. Please have the look at the screenshots and the patch attached. Let me know if there are any changes required. @patilswapnilv hi, thanks for the patch. It looks much larger than it should be however. There should only be one patched file in the patch, wp-admin/css/common-rtl.css. The wp-admin/css/common-rtl.min.css file will be generated automatically by the build process. Then there are several other files in the patch that seem unrelated to the change you're making. I think, I made some mistake while making the patch. I will remake it and then upload. Sorry for that, and thanks for bringing it to notice. @patilswapnilv and also, FYI, the RTL files are also automatically generated from the LTR files. This ticket was mentioned in ​Slack in #design by westonruter. ​View the logs. This ticket was mentioned in ​Slack in #design by presskopp. ​View the logs. @westonruter Ohh, sorry did not know that. Do I need to update the patch, with just the common.css file diff. ? @patilswapnilv no, no worries. Just something to keep in mind to make it easier for you in the future. Related: #35622 (on hover it changes to #f00). 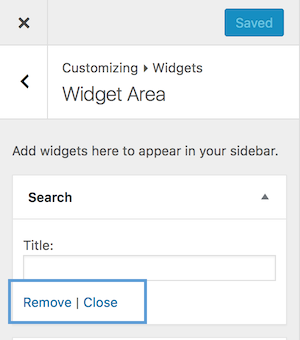 I have attached a patch (37016.diff) with screenshots for the color of Delete / Remove links in admin Widgets and Customizer Widgets. Please review. This is my first patch so, please let me know if there’s anything to be improved / changed. I totally agree we should catch all the instances we have can in this ticket @afercia. I'm removing ui-feedback to has-ui-feedback as so long as this is a consistency patch we're all good there. Thanks for the first patch @ibachal and the great work everyone. A great catch @monikarao. Thinking the "Remove" and "Cancel" links in nav-menus.php are a different case, they use a styling that is a bit uncommon in core and maybe should be discussed separately. It would be useful to have a separate ticket for them to better track changes and history. Going to open a separate ticket for the menus screen and I'd propose to use this ticket to fix only the widget ones. About the color contrast ratio, see #35622. Refreshed patch to take care of the underline and the :focus state.